A question that is capable of equally bothering designers, startup founders and mid size / big size company CEO’s. And rightly so! It’s rather frustrating to realize that you invested in a brand only to discover that it’s being confused with some other well known company. (The obvious one) Which logo came first? Are the logos vaguely resembling each other or do they have enough similarities to a degree that it can’t be considered coincidental? Is your product / service targeted at a local or international audience? Are the companies in question operating in the same industry; do they have direct / indirect competition, or are they unrelated? Is your target audience likely to confuse your company with another one when seeing your logo? Are you simply testing a bunch of MVP’s or creating / redesigning a long-term brand? Now let’s get to the tools and techniques for finding out your logo’s uniqueness level. Please note that this list is in no way a comprehensive fail-proof instruction and doesn’t include hiring lawyers/patent attorneys the big-corporation-style, but rather serves as a simple guide to increase the odds of discovering if your logo is unique enough. The primary workhorse that helps in finding visually similar images with the help of Google’s ever improving image recognition algorithms. Let’s put our ‘Schmapple’ through Google’s machine learning digestive system and see what comes out. 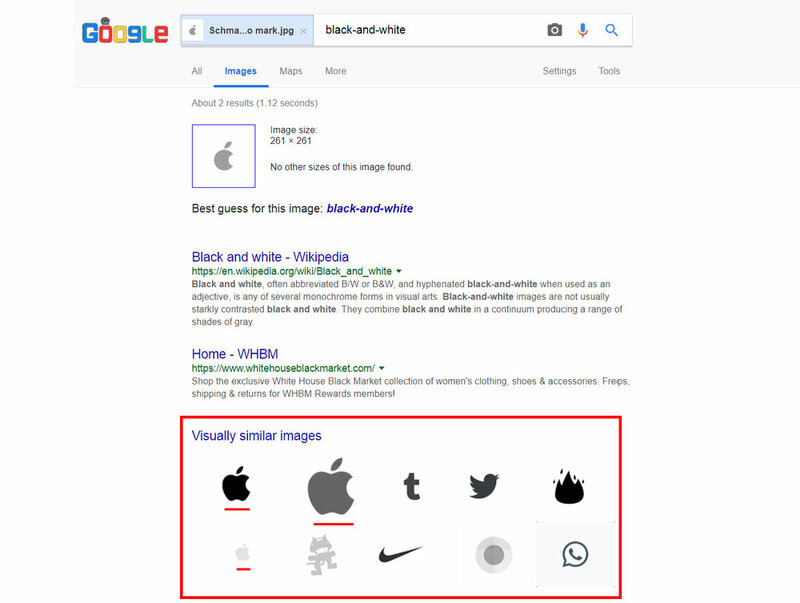 Nice, looks like our logo is as unique as it gets! Ok, this one was easy to find out, as it was admittedly copy-catted from an iconic brand. Use solid color background to not confuse the AI. Try isolating your icon from the typeface for better results. In case of lettermarks or wordmarks separate the most customized/specific initials. Try both colored and grayscale logo variations. Let’s see what other steps we can go through if the first one didn’t reap positive results. Making sure your branding is unique is especially important in the context of the industry / region that your business operates in / offers products and services to. Are you running a consumer tech business that focuses on producing mobile phones? Try to find lists of as many mobile phone manufacturing brands as you can. It comes without saying that you should first fully understand your market and who can be considered your brand’s direct/indirect competition. In fact, the target market, brand values and business strategy should be all defined before investing in logo / brand identity design. Search for the industries and regions of your choice on Crunchbase and AngelList, these platforms are quick to navigate and they feature tens of thousands of startups, small-mid size businesses and Fortune companies worldwide. Use the Advanced Google Search to filter regions and search operators (commands that help to narrow down your search). Finding lists with logo thumbnails is obviously a plus, so you don’t have to waste your time searching for individual companies. Use local and international business directories. Yellowpages is a good starting point. Whereas other searching methods show results from a huge vastness of web, and leading to logos mostly in the context of existing companies and/or in the context of promoted content, this method is specifically targeted at designers and their projects. This means that you’ll be able to find logos of newly formed startups that still didn’t establish a web presence to be easily found elsewhere.